Does…does anyone use the Gear Chronicle Legions? Are there even multiple Legions? AUTO: [CB1] When this unit is placed on R, if your vanguard is in Legion, you may pay the cost. If you do, choose 1 of your opponent’s grade 1 or higher rear-guards, and your opponent puts it on the bottom of their deck. 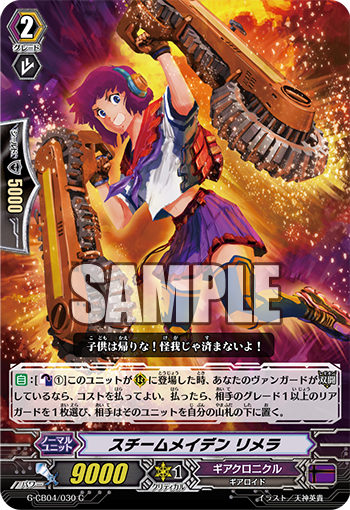 Today’s card we’re introducing is from the Clan Booster “Gears of Fate” (on sale September 30th, 2016) “Steam Maiden, Limera” a Grade 2 《Gear Chronicle》 Unit that supports Legion! The ability of “Steam Maiden, Limera” is a simple but powerful one. When it’s placed on the field while your Vanguard is in Legion, you can return 1 of your opponent’s Grade 1 or higher Rearguards back to the Deck. This effect activates even when it’s placed on the field via 【Time Leap】, so you should have at least one copy in a Deck as a 【Time Leap】 Call option. We should bring up the fact that it’s a Unit with an ability similar to that of “Steam Knight, Kalibum”, in that they both let you return an opponent’s Unit to the Deck at your choice, but with 9000 Power, “Limera” is a bit stronger. And it’s even stronger if you combine it with the Legion “Sorrow Divider Dragon” and “Steam Knight, Puzur-Ili”, who we introduced a while back! “Gears of Fate” has other cards that strengthen the 《Gear Chronicle》 Legion strategy, so be sure to pay attention!